I saw one of the 8 shows they played at Yoshi's. Absolutly mind blowingly awsome! Actually, even better! Also they all came out for photos and autos. Very nice lads! Great music. I can't wait for the CD and DVD! 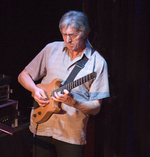 Great to see Allan Holdsworth still playing. I last saw him in some pub in Putney (I think it was) some 25 years ago. The shows at yoshis were absolutely awesome. my friend saw all eight shows !!!! my saturday nite show was totally cool and alan was sitting with me at the bar having coffee before the show, hes a down to earth humble and likeable dude. I also was at the Saturday night 10:00 Yoshi's show. We sat in front of Alan Pasqua who was having a great time. The playing all around was terrific. Wackerman sounded like Tony that night. I am psyched to see/hear the DVD in 2007. This site is small but mighty!